1. Annie Leibowitz photographs the British monarch. 2. Platon photographs the Russian one. This Times article from about a week ago about the wait to get Social Security disability benefits was seriously disturbing, and especially so for someone who worked as a claims representative for SSA only a few years ago. I knew the wait for a decision was long, but my ballpark guess for a mean wait time for a hearing would have been 15 months, not 3 years. (In fact, I've advised a number of people with the 15 month figure.) I don't have any issue with the Times's analysis of the crisis, but I will mention a couple items that I always felt contributed to the wait times. First of all, there is the fee for lawyers who represent applicants through the process. These benefits are standardized by administrative law, and amount to 1/4 of all back pay due, up to a limit. This means that up to a certain point, the lawyer has a great financial incentive to delay the process, because a speedy favorable decision will actually decrease the pay he receives. This law is appalling and should be changed. The other odd thing about the process is that applicants who are initially denied by SSA are required to apply for a reconsideration of the original decision by SSA before they can apply for an administrative hearing. This may be how things always work across all administrative bodies in the government (I'm certainly no expert), but in my experience at SSA the second decision was virtually guaranteed to be the same as the first. This seems like an awful waste of both of the bureaucracy's energy and of the applicant's time. Kottke links to the Reuters photos of the year, which are great both as a review of the year's events and just photographically. I thought it was interesting that Reuters seems to end up with a lot more telephoto shots than the New York Times; I wonder if this has something to do with the widescreen photo layout the Times uses at the tops of its web articles. An interesting coincidence: the shot on the front page of the Times as I'm posting this (it also appears at the top of this article) must have been taken with moments of one of the Reuters shots. The Reuters shot is better. 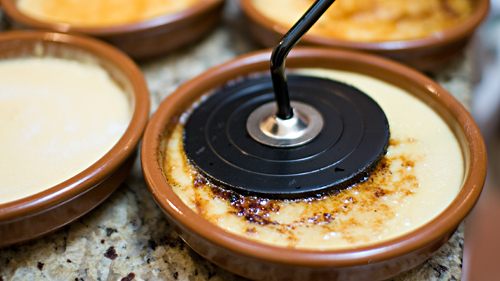 Some friends had us over for an "Iberian-themed" dinner last night, and for dessert I decided to bring some crema catalana, which is similar to crème brûlée, but lighter and more festive. I'd never had it before, so I don't know how true to form my version was, but in any case it was delicious. For me the lovely citrus, cinnamon, and vanilla gave it a timely holiday feel. The ramekins and the iron you see in the picture (as well as the recipe, come to think of it) were given to me by an old friend who lives just outside Barcelona. Sorry for the sudden disappearance! I should be back to posting regularly now. Basically things got a little crazy with a couple photography projects I've been working on, and then we were out of town for a couple days. The good news is I've finally seen the light and started using an RSS aggregator, so maybe I'll be able to keep up with things a little bit better. This is the archive page for December 2007. The main index is here; other archives can be found below.